Park End B&B dates from the mid-18th Century. 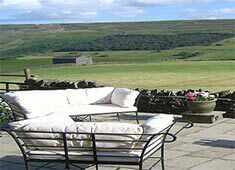 Located between the villages of Reeth and Low Row, on the south-facing valley side above the River Swale, it enjoys outstanding uninterrupted views of Swaledale in the Yorkshire Dales National Park. There is a terrace for leisurely drinks or for those who enjoy art, why not sketch or paint the marvellous view! 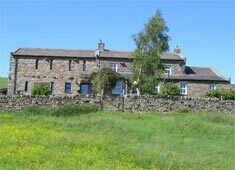 Park End B&B is ideally situated to explore and enjoy the outstanding beauty of the Yorkshire Dales National Park. Hidden from the road, you approach the property down a short track and take in the view up this beautiful valley. Find many wonderful walks nearby, hire a bike in Reeth or fish the River Swale. The 2014 Tour de France Route and Pennine Way pass close by. 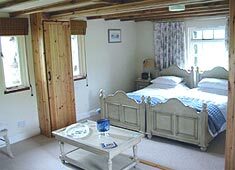 There are two en-suite twin-bedded guest bedrooms, both with shower bathrooms. The 'Barn Room' occupies the first floor of the west end while the 'Byre Room' is on the ground floor of the east end with its own Satellite TV. 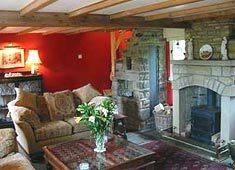 The cosy residents' lounge offers a wood burner and Sky television Breakfast is served in either the original cottage dining room or the adjoining breakfast room with the choice of full English using local produce or continental if preferred. Evening meals can be provided at a variety of local venues.